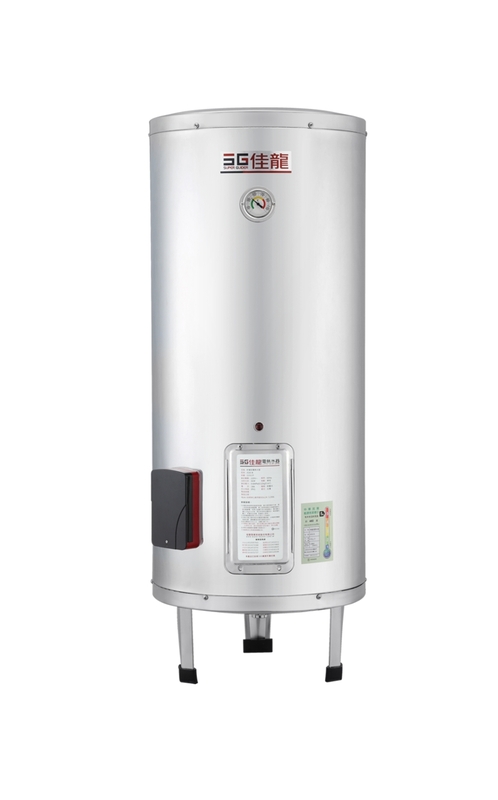 Storage electric water heater comes in wide range of capacity to suit all sizes of family or group. 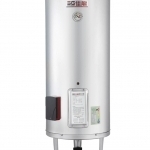 Stainless steel tank can withstand pressure up to 12kg, which is also designed with insulation. Temperature-pressure relief valve and check valve have designed into one for easier installation. All models including Super Guider leakage circuit breaker and installed in transparent cover. Stainless steel tank is firm enough to withstand water pressure of up to 12kg. The thick PU foam insulation helps to retain hot water for longer time. Clear power/indicating light illuminates when heating commence. Special order is available for specific environment conditions. Easy heating element replacement and maintenance design. All Floor-Standing Series comes with tripod. Install as close to faucet as possible to prevent heat lost in pipe. Ensuring the tripod or wall-mounted hook is tight when installing. Connect safety valve to cold water inlet. Connect pressure releasing pipeon pressure releasing hole of the safety valve can avoid danger cause by pressure releasing. Note that the pressure releasing hole should never be blocked. Keep the cold water inlet faucet open, it is normal if safety valve drips during heating. Inlet water pressure is recommended to remain under 1kgf / cm². However, highly recommended to install pressure decreasing valve when pressure exceed 2kgf / cm². Inlet and outlet connection gauge should be the same according to the product specification. Install safety valve is necessary ensuring the safety. Power cord is either black or red. Make sure to connect the green earth cord correctly. 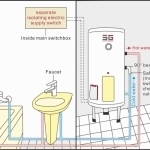 Note that the blue dot inlet pipe indicates cold water inlet pipe whereas red dot indicates hot water outlet, make sure installation is correct. All electrical installation should be carried out by a qualified person. Make sure the operation of Power and water supply before contact the distributor. Please switch off the power and take off the terminal of the electrical regulation and all wires before replacing the electrical regulation. Ensuring the screw and nut are tighten after replacement and wires arrangement. Water (faucet) should be leaked off (switch-off) before replacement of heating element function. 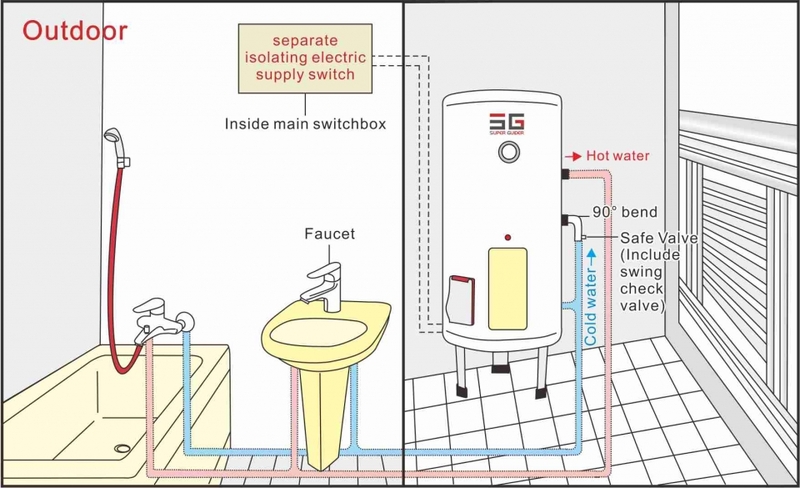 Once installation completes, turn on both hot water faucet and cold water faucet then open the clean access. Heating element function is able to be taken apart by wrench. Ensuring the rubber washer is well fixed preventing the water heater from leaking before re-arranging the heating element function. Heating system should be cleaned once two year ensuring the heating quality which is highly recommend. Scheduled cleaning the exterior of water heater to keep intact. 1 year warranty for the product. Overheat Preventive Device will automatically interrupt by abnormal overheating. Attention: Turn off the power immediately while power indicator not illuminating and contact customer service.